Hey, Norman! Is your mom home? As is so often the case, another of my "simple projects" ended up considerably more elaborate than originally planned. This is intersession week: no school! So doesn't it just figure... I'm sick! Sicker than usual, that is, by which I mean I've contracted a cold. I felt it coming on Thursday evening. I knew I had it for sure by midway through Friday. Seeing as how these things usually linger for about ten days, I should just about be getting over it by the time school resumes a week from today. We had the television cable disconnected about three weeks ago. So far the cable company has yet to come out to actually disconnect anything. Yesterday, feeling ill and lethargic, I probably watched more television in one day than I have in several months. I sat here on the sofa, tuned in to HGTV, the Home and Garden Television channel, and listened to remodeling shows while I built a haunted house out of cardboard and coloured construction paper. Coloured: I've never outgrown my junior high school affectation of using the chiefly Brit. variant spelling of some words. The haunted house is supposed to be part of a seasonal bulletin board display in an elementary school classroom. The original plan was to make a simple construction paper shape and paste it to the bulletin board. Then I started thinking a slightly 3-D effect would be cool, and reasonably simple to achieve by building a sort of flat box shape out of cardboard. And hey, instead of gluing on coloured-paper windows, wouldn't it be better to cut out the windows and fit them with a translucent backing? Rather than simply covering the cardboard with black paper, wouldn't it look more like "weathered" siding to cut strips from different shades and textures of paper? The roof can't be plain brown, it needs to have shakes or shingles. And a rooftop railing. Latticed windows. A front door that opens. A porch. I probably have ten hours in this silly project. "Are you more artistic than a fifth-grader?" I'm certainly not. 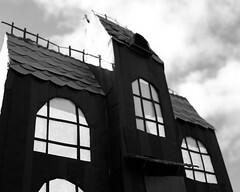 This thing looks like... a fifth-grader's model of a haunted house, made out of cardboard and construction paper. In other words... it's kinda cool, in a cartoony sort of way. Serendipitously... or possibly as a result of some subconscious intent ("sublimination, perhaps?" queried one of my better-educated -- too well-educated, some might say, altho' "perspicacious" might be more accurate -- friends), the scale of the completed false-front haunted house is just about ideal for Pinky Street figures! Honestly, that was not the plan! The size, about 23-inches tall now that it's done, was calculated by measuring the available display space on the classroom wall. Anyway, that was my day yesterday: sitting on the sofa watching Design on a Dime while cutting out little bits of paper and getting Elmer's Glue all over my fingers. At least, I think it was glue. I was kind of sneezing and coughing a lot. The photos, taken in the cheery Hawaiian sunshine out in the yard this afternoon, are not particularly atmospheric. Of course, the house isn't particularly atmospheric, resembling a gingerbread cottage as much as it does the House of Usher. It's not nearly on par with the U-Boat, but still, I should be able to get some more effective images. When I'm feeling less listless I may try a few more shots. You know that sounds familiar. But then I work in software. So when a manager comes up with a 'simple' project we all ahev to do our bestest to mot openly laugh. In software there are no simple projects.